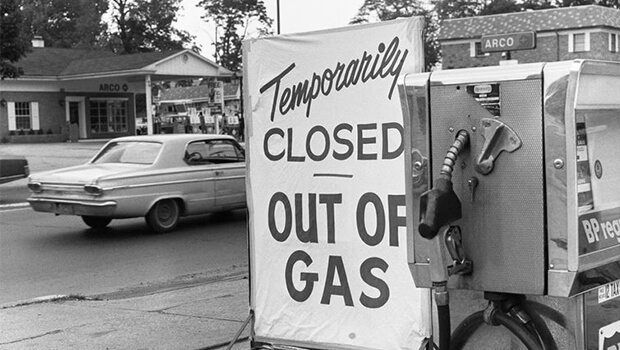 In the middle of 1973, even before the OPEC embargo, an American oil crisis was on the horizon: Domestic reserves were low (about 52 billion barrels, a 10-year supply); the United States was importing about 27 percent of the crude petroleum it needed every year; and gasoline prices were rising. The 1973 war with Israel made things even worse. OPEC announced that it would punish Israel’s allies by implementing production cuts of 5 percent a month until that nation withdrew from the occupied territories and restored the rights of the Palestinians. It also declared that the true “enemies” of the Arab cause (in practice, this turned out to mean the United States and the Netherlands) would be subject to an indefinite “total embargo.” Traditionally, per-barrel prices had been set by the oil companies themselves, but in December, OPEC announced that from then on, its members would set their own prices on the petroleum they exported. As a result, the price of a barrel of oil went up to $11.65, 130 percent higher than it had been in October and 387 percent higher than it had been the year before.